Alena and her mentor Matthew Ngau Jau (left) with their sapes’. SARAWAK is a blessed state within Malaysia — she boasts natural resources such as forests, mountains and animals that are the dream of every nature lover, a rich and diverse culture unlike any other that can be found in any country and a unity among a melting pot that is unrivalled. This is fact is not lost on Alena Murang, a born and bred Kuching-ite, who also spent five years of college and university in England, graduating with a First Class BSc (Hons) management degree from the Manchester Business School. 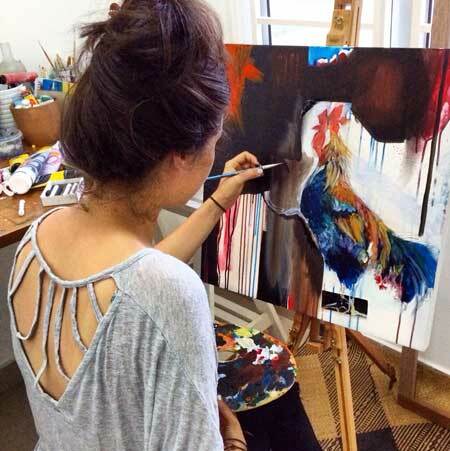 She went on to work in management consulting at Pricewaterhouse Coopers, focusing on environmental sustainability, before leaving to study visual arts for a year in Singapore. 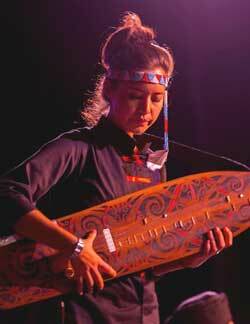 The talented 26-year-old advocate of Bornean art, culture and music is also an amazing sape’ (Dayak traditional lute) player. She studied under one of the country’s foremost sape’ players — Matthew Ngau Jau. “My girl cousins and I used to learn and perform traditional dances, and sometimes, our dance sequences were either too long or too short for the sape’ CD track. So seven of us girls decided to pick up the sape’ while the other girls danced — therefore, we could choreograph dances as we liked. “I had an old sape’ made by Nikal and painted by the late Tusau Padan (world famous Sarawakian sape player who was mentor to Matthew Ngau) in the house. In fact, I still remember being very young — probably about seven years old — and visiting Tusau with my parents when he was very ill.
“So it’s a mix of things that brought me to learning the sape’ under Matthew who is a great teacher. He’s very patient, calm and encouraging,” Alena told thesundaypost. She also said she never felt any resistance or discouragement from anyone when it came to pursuing the sape. “Everyone was very supportive. I think at the time, it wasn’t common to see teenagers — boys or girls — playing the sape’. So generally, people were supportive. From what I understand, in pre-Christian times, the sape’ was used to connect to the spirit world and, therefore, it was usually men who played it,” she explained. Dancers and sape’ students rehearsing for the Youth Festival during National Youth Week. 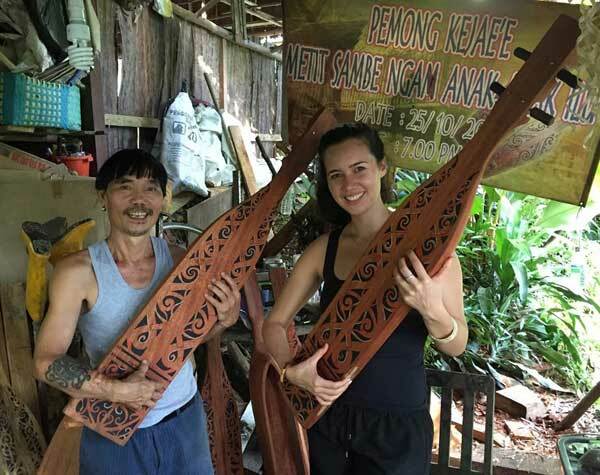 Alena, who works full time as strategy manager for Teach for Malaysia, also teaches the sape’ and traditional dancing in Kuala Lumpur where she is currently based. “In fact, 12 of my students performed during National Youth Week in Putrajaya. Rakan Muda (under the Youth and Sports Ministry) approached me in March and elected me as a Rakan Muda mentor. 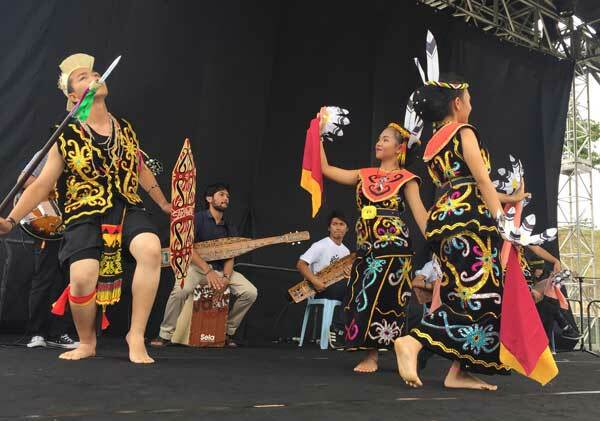 “For six weeks, I received support and funding from them to mentor youths in Kuala Lumpur in sape’ playing and traditional dancing or ngarang. “The dancers were from Sekolah Menengah Kebangsaan (SMK) Lutong in Miri, and to support the dancing, I engaged with a colleague of mine at Teach for Malaysia — Cikgu Deyline Samail — as a dance coordinator, as well as with an excellent choreographer Mohammad Hazwan, who is an alumnus of SMK Lutong. “We integrated ngarang and ngajat moves which were new for the dancers. The output of the six-week mentoring was that the mentees had to come together to put on a show at the Youth Festival,” Alena said, adding that the students ranged from 14 to 25 years old. Alena recounted how the dancers and sape’ players only met and practised together during the soundcheck — two hours before their performance. “The dynamic between the two teams was fantastic! The sape’ players had composed a contemporary version of the traditional Datun Julud where they incorporated new lines and dynamics and even introduced a guitar and cajon to their performance. It was so lovely to see them performing and I am so, so proud of and thankful to the mentees as well as Deyline and Hazwan. “On the second day of the performance on May 23, the sape’ students announced they were going to play three songs — we had only practised one song! Somehow, they had managed to practise and put together covers of songs by Zee Avi, Estrella and Sheila Majid all on the sape’. “For me, that was so magical — as a mentor, it’s not my style to be directive but to give the mentees the tools, skills and environment to be creative and to discover things for themselves and to see all that happening for the first time on stage was just incredible,” Alena shared. Alena playing the sape’ during a show. Elaborating further, she said part of her mentoring style was integrating emotional intelligence into classes, particularly self-awareness and social awareness. “For example, having a session on what is dance, why do I dance and simple reflections such as what did I learn today, how do I or we want to improve and how will we do that. I had one sape lesson in the dark to encourage the students to listen and feel rather than look at their fingers or the sape’. Despite not owning a school yet, Alena continues to mentor five students even though the Rakan Muda project has officially come to an end. She said she had even been receiving a lot (around 20 to 30) of enquiries about sape’ lessons, adding that it was great there was so much traction. “However, I have a few things I’m working on at the moment, so I need to consider capacity. I want to make this a priority because it’s important and I will be thinking of a sustainable way — for example, in terms of funding, structure, location and more sape’ teachers — to make sure everyone who wants to learn the sape’ has a chance to learn,” she added. Alena also noted that the reception in West Malaysia and outside of Sarawak, in general, had been fantastic. “Generally, West Malaysians are very curious about Sarawakian culture from the language to livelihood, music, food as well as interaction. Because most of my paintings and music are influenced by Borneo, people often approach me with many questions about Sarawak, so I will tell them what I know and share with them my experiences. “I’ve had some friends, and even some strangers, ask if they could just come and watch a sape’ or dance class and, of course, they can. “I remember one guy who said to me after watching and saying how he wished he could stay in the music. Sape’ music gets to everyone — it’s so haunting and magical. “When I played in America last September to November, there was a lot of interest in the sape.’ My band (Diplomats of Drum) did a version of Datun Julud where we incorporated the didgeridoo, electric guitar, bass guitar, flute and gendang and it was quite intense. An American guy came to me and said it made him cry while another lady said she felt intensely spiritual during the song,” Alena recalled. Aside from promoting and spreading awareness about Sarawakian music, she is also very active on the arts scene where she draws inspiration from her childhood and love for Borneo. “I went through a phase of traditional Sarawakian patterns and then Bornean animals in watercolour. “Now I paint many portraits of Kelabit and Penan people,” revealed Alena, who most recently was on the panel for the Borak Arts Series, organised by My Performing Arts Agency on June 13. She added that she was finding her focus in working on projects that used art as a medium for positive social impact, and she even started a company called Art4 which focused on that. Additionally, she would be running a workshop on Highland Arts in Ba Kelalan from November 15 to 17 at the e-Borneo Knowledge Fair 5 (EBKF5). “EBKF5 showcases the use of information communication technology (ICT) for development in rural communities and I will be working with the community, artists, researchers and IT professionals to discuss and innovate ways to promote the arts of the Highlands (generally Orang Ulu art). “I would like anyone who is passionate, experienced and/or actionable in the areas of indigenous arts and crafts, art promotion and ICTs for development to be present there. Those interested can check out http://www.ebkf.org for more information. Alena said being home to several distinctive and related indigenous cultures, the Highlands in the heart of Borneo had spawned a range of vibrant and unique art forms that continue to reflect their origins while simultaneously adapting to contemporary influences and opportunities. “ICT has an important contribution to make to the preservation of artistic traditions as well as in promoting new forms of expression and the wider dissemination of visual and audio creations, and this workshop will address the problems and opportunities in cultivating the arts of the highlands and how ICT might be used to increase artistic pursuit among the highland communities and to enhance their appreciation among a broader audience,” she added. Alena is also active on the arts scene.